Fixed the typo in the last paragraph. Now shows 0.28°C/century warming. This is supposed to be a collection of sites that required no adjustments between 1931 and 2008, because there were no significant site or environmental changes. In fact, every one of the eleven stations underwent changes, some of them huge. Six of the sites didn’t even exist before WW2. Tauranga moved across the harbour to Mount Maunganui. Molesworth’s 1994 change was terminal—it went out of existence. Queenstown’s environmental problems were so bad that Salinger wouldn’t attempt homogenisation in 1992. The 11SS is a very useful corroboration of the 7SS if confined to the 45-year period that the eleven stations all existed. From 1949 to 1994, the eleven stations did indeed require no adjustments and, revealingly, showed a temperature rise at the rate of 0.18 0.28°C/century. Mullan (2012) is not relevant literature. In our paper we are at pains to make clear that our aim is to follow RS93 exactly when performing our reanalysis, and that is what we did. Mullan (2012) suggests possible modifications to RS93 (using very long time periods) based on certain samples from the 7SS. It does not address an interpretation of RS93, but sets out the author’s personal perspective on what RS93 should have proposed. Criticising or modifying RS93 in any way was not within our purview, so Mullan (2012) has no relevance to the journal paper. SST reconstructions are even more fraught with raw data problems than land-based records, especially in the Southern hemisphere. This is well known (Trenberth et al., 1992). There have been numerous attempts to improve this situation, but none have been successful to the point that anyone could state that a reanalysis of NZ land-based temperature records could be right or wrong based on SST reconstructions such as ERSST. In our paper we draw attention to Folland & Salinger (1995), mentioning the difference, but we would never make the mistake of assuming SST trends are gold-standard records – especially in this part of the world. Indeed, the Hadley Centre (including Dr Folland) has now officially recognised that its previous assumptions regarding pre-WW2 adjustments to ship records have been mistakenly based. We would also add that NIWA’s 0.9°C/century was as far above F&S (95) as ours was below it, yet NIWA at no stage withdrew their work due to incompatibility with an SST reconstruction. But if Mullan (2012) is relevant (supposedly), what was Mullan et all (2010) all about? Very different approaches. M12 was a response to the revelations of the NZ Climate Science Coalition Statistical Audit of the NIWA 7-Station Review (2011) that showed NIWA’s M10 definitely did not follow RS93. M12 then attempts to “modify” RS93 in ways that, Brett Mullan hopes, justifies M10 – but impossible to do if neither M10 nor M12 follow RS93. The genuine ESS graph has a very different shape from that of the impostor on the NIWA website. It is boring. One can see at a glance that the overall warming/cooling trend is close to zero. In fact, the warming trend rate is 0.28°C per century. As I recall, de Freitas et al (2014) states, approximately, “Our analysis, which uses updated measurement techniques and corrects for shelter-contaminated data, produces a trend of 0.28 °C per century. Ruakura ! !SS anomaly is effectively 2 halves centred at 1970 and flat after 1970. 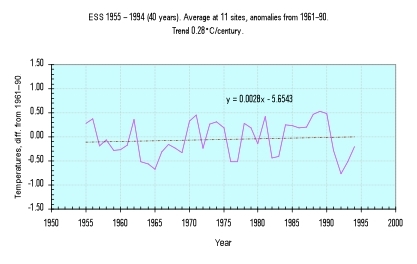 1970 – 2009: 0.049 C warming @ 0.012 C/decade, 4 decades. 1931 – 1970: 0.532 C warming @ 0.133 C/decade, 4 decades. 0.56 C warming @ 0.14 C/decade, 4 decades. Except there were large spikes 1935 (14.1) and 1938 (14.1) which are identical to 1970 (14.1) and typical of 1970 – 2009 at Ruakura. Also typical of the current 7SS regime 2000+. In other words, there was a cool period between 1938 and 1955, both of which are similar to the present. But was there any effect from the obvious site changes 1931 -1970, trees and buildings? I think there would have been. Interesting though was this “Climate records have been collected from this location since 1906”. I’m struggling to see the climate change. Maybe the authors would like to speculate why their estimate for NZ warming is so much less than the global average? First and foremost, the average warming is what it is, formed out of the observations adjusted by the sensible, peer-reviewed mathematics of Rhoades and Salinger. There is no other reason. Second, perhaps you might in turn speculate on why NIWA’s estimate is so much more than the global average? AIDE MEMOIRE: NIWA: 0.9°C. Global: 0.6°C. dFDB: 0.3°C. As to what climatology might have been responsible (which I’m sure is the actual focus of your query) you’ll note it wasn’t the purpose of their paper to investigate why the temperatures moved. They set out just to establish what the temperatures were. Still, there is an answer to your query from a very highly placed source. David Wratt actually answered it not too long ago: he said New Zealand temperatures are expected to be mediated by the ocean we’re in, so they will go neither too high nor too low. As that expectation must be based in observation (he being a scientist and everything), it means the ocean has been doing its mediating for quite a while. Hence, we have experienced less warming than the global average. I hope you ponder why NIWA’s record of the past is 50% higher than the global average, given Dr Wratt’s forecast of moderation. The facts show that our actual temperatures have indeed been moderate, but it seems that not much moderation was in evidence when the ‘official’ NZTR was being adjusted—as we’ve just proved. Maybe Simon would like to speculate on why NIWA’s measured Hamilton Ruakura 11SS data since 1970 is completely at odds with BEST’s Hamilton warming? Just where did BEST find all that Hamilton warming that NIWA didn’t measure Simon? Again, where did BEST find all that NZ warming that NIWA didn’t measure Simon? That is the era of AWS, bare minimum adjustments, and reference stations, is it not? That mathematics including UHI/sheltering adjustments, of Hansen. Presumably Sir Peter Gluckman has asked for a please explain from NIWA.